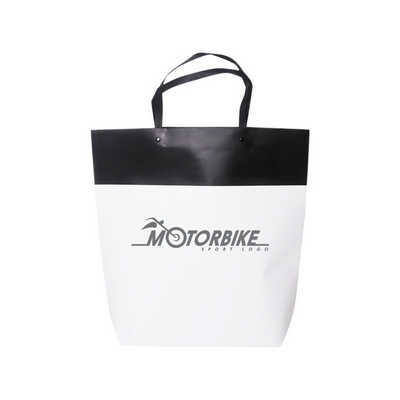 Large Black & White Boutique Kraft Paper Bag is ideal for showcasing your elegant branding logos. These personalised paper bags are available to order in a choice of colours, sizes and printing methods. They can be supplied unprinted or custom printed, available wItscreen print, full-colour print, add-on stickers, add-on stamps, or hot stamping. These paper bags does not only have an excellent capacity for carrying all your goods, but also for displaying your company logo and name. Give them away at any promotional location or take them with you anywhere you go to increase your brand exposure! Material - 250gsm paper Colours - Black&White Product size - 380(L) x 380(H) x 100(W) mm, Handles:140mm, Gussets:100mm Print size - 320 x 300mm. Price includes : 2wk 1 col/pos print. Setup is included.